While Bermudians anxiously await the publication of any leaked US diplomatic communiques relating to the Bermuda in the ongoing Wikileaks “Cablegate” document dump, once-top secret communications between the White House and Downing Street almost 40 years ago spelling out the island’s possible role in the event of a global nuclear war are freely available on-line. Routinely described as “strategically sensitive and classified” in Congressional reports, US Navy activities in Bermuda during the Cold War with the Eastern Bloc were called a “strong thread in NATO’s defense fabric” by the US Department of Defence. In order to protect the North Atlantic sea routes near Bermuda, the US operated three military bases here until 1995 – the main US Naval Air Station at the East End; the smaller US Naval Annex in Southampton; and the Tudor Hill Laboratory. The Navy used the NAS as a regular deployment airfield for squadrons of nuclear-capable P-3 Orion anti-submarine warfare operations. 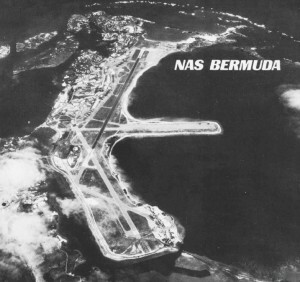 NAS was also designated as a deployment base for nuclear depth-bombs in US strategic contingency plans. During peacetime no nuclear weapons were stored in Bermuda — but in “times of advanced readiness’ for anti-submarine warfare operations in the North Atlantic, authorisation had been given for the deployment of 32 nuclear depth bombs here. By 1995, the range of submarine-launced ballistic missiles (SLBMs) had so increased that Soviet submarines operating in the Atlantic no longer found it necessary to come within range of Bermuda in order to strike American targets and the Bermuda bases were mothballed. Submarine-launched Soviet ballistic missiles fired from the Bermuda area would have only taken about 16 minutes to reach military and civilian targets along the US East Coast. Soviet submarines were not withdrawn from the Bermuda “patrol box” until the late 1980s. As late as 1987 the former Soviet Union engaged in a large-scale submarine exercise near Bermuda involving five vessels armed with dozens of strategic missiles — each carrying as many as 10 independently-targetable nuclear warheads. The Yankee-class submarines, among the quietest in the Soviet fleet, were so difficult to detect that nuclear depth bombs dropped from P-3 Orion patrol aircraft flying out of Bermuda were thought to be the only assured way of destroying them in the event of the Cold War heating up. “The Anti-Submarine Warfare weapon deployed in Bermuda would have been the B57 [an underwater test detonation is pictured at left] whose explosive yield ranged from five to 20 kilotons,” said Dr. William Burr, senior analyst at the National Security Archive project of Washington’s Georgetown University, who has studied the declassified documents. One kiloton equals the explosive power of 1,000 tons of TNT. It’s estimated the atomic bomb which destroyed the Japanese city of Hiroshima in 1945 had a yield of about 15 kt. 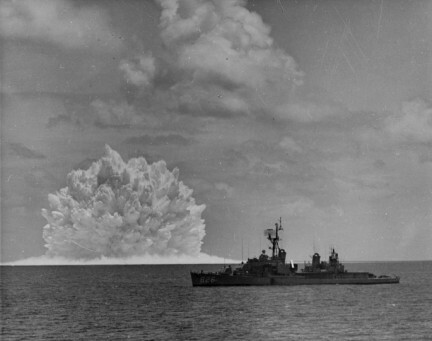 Bermuda seems to have been earmarked for the proposed deployment of nuclear depth bombs in the late 1960s. By December, 1970 US President Richard Nixon and UK Prime Minister Edward Heath confirmed a consultation agreement about the use of any nuclear weapons stored here. Since the beginning of the Cold War, the British sought such commitments from the White House to ensure the United States would not order nuclear strikes from US bases located on British territory without London’s explicit consent. Although background documents remain classified and details on the circumstances of the proposed Bermuda deployment are unavailable, it may have related to US concerns about the expansion of the Soviet submarine fleet in the Atlantic. Certainly, the deployment was significant enough for then US National Security Advisor and future Secretary of State Dr. Henry Kissinger to have maintained several folders on the “British-US Nuclear Matter (Bermuda Exchange)” in his office files, according to Dr. Burr. 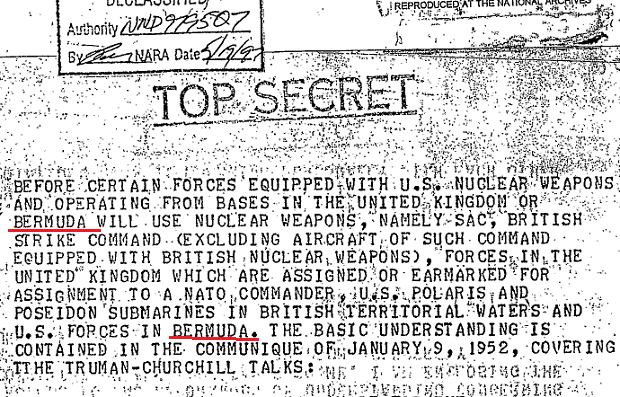 This partially edited document on the Bermuda nuclear deployment follows the structure of earlier Anglo-American understandings while this follow-up communique posted below, released in its entirety, serves as a key to the excised portions — mentioning Bermuda specifically. Not much left of the weapons depot these days.. It was right there, on the very tip of the base. Surrounded by a 40 foot blast wall. (wooden, filled with sand, barbwire on top). Inside were rolls of small bunkers, 48 IIRC. A squad of US Marines were on guard 24-7.